I have been using Sonarr for a long time and it has always worked. Recently (in not sure a few weeks I think?) Sonarr has been unable to contact SAB. I have not changed any of the configuration settings in Sonarr or SAB, I have hower checked they are still correct which they are. I also run Radarr and this can connect to SAB no problem with the exact same settings. Did you set your URL base with your API Key? Hi markus, I’m not sure what you mean by URL base. In the downloader setting I have the current API key from SAB. This API key is also used by Radarr which has no problems. The URL base in Sonarr’s SAB settings. 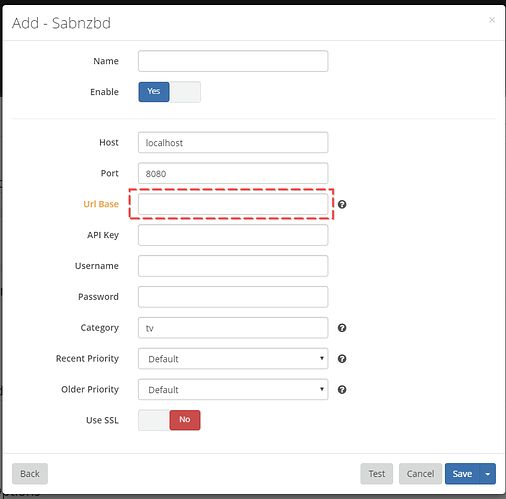 It only needs to be set if you’re using a reverse proxy in front of SAB, the default is empty. My settings screen does not have a URL Base option. I did, however, get it to work I deleted the old SAB connection and made a new one with the same details. You can recognize those because they have a different color from the normal options.